Shipping and handling are free for orders shipped within the United States. We will do our best to get your order in the mail within 72 hours of receiving the order. Your satisfaction is guaranteed! Please let us know if there is any problem with your order. We will do whatever it takes to get it right! For an order form, please click here. When it's time to buy, you'll be taken to PayPal to finish your purchase. You don't need a PayPal account to purchase from our store. The little ones will chew on these (wash with approved bleach water solution) and the older ones (3-5 year olds) can "wash" their arms, legs, cheeks, etc. Another great sensory warm-up. 6 balls to a package. Soft, pliable and washable by hand! 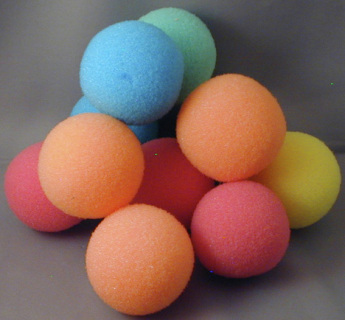 We use them with our parachute, buckets (dump and fill), simple shape sorting buckets (squeeze the ball through the small opening), and to rub on our arms and legs (sensory warm-ups). 12 balls to a package. 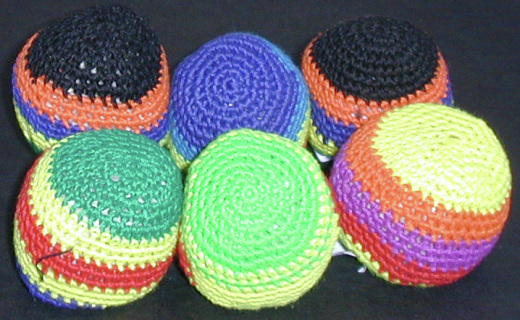 Can be used as a sensory warm-up or put in a child's pockets to help with that proprioceptive sense. Set of six.